This is a little story I wrote 20 years ago! I wrote it for some competition at the time for a well known brand of tea here in the UK which uses little Tea Folk as part of its advertising campaigns. (I’d better not name this tea – I don’t want to be accused of advertising!) But I never did anything with it and the other day, I found the manuscript in an old file I’d kept. The paper was all yellow round the edges, reminding me of the way schoolchildren try to make stories and treasure maps look authentic by staining the paper with coffee or tea. Well, I didn’t need to do that. Anyway, I made the characters into gnomes, gave them different names and changed a few details and typed it up. I love the film Gnomio and Juliet and am quite partial to gnomes. My husband refuses to have any in the garden, so I have to use my imagination. On one occasion, my mischievous daughters, Nicola and Louise, bought a few gnomes and hid them around the flower beds. My husband’s growls as he found each one, were quite hilarious. One warm and sunny summer’s afternoon, the Garden Gnomes of Greenwich were relaxing in Gerald’’s favourite tea garden. Horace was brewing the tea and Michael was sharing his plans for his next detective story, when a sudden flash and a puff of smoke made them all jump. Seven pairs of eyes blinked as an odd little man, no bigger than a nearby plant pot, became visible through the smoke. Seven gasps of astonishment caused the little man to wobble precariously on the rock he’d landed on at the edge of Gerald’s delightful fish pond. 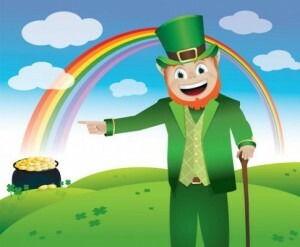 ‘You’re a leprechaun!’ young Freddie blurted, pointing at the tiny figure. ‘Of course I am!’ the indignant elf snapped in crotchety Irish tones. ‘Sure, isn’t that plain fer all t’ see?’ He brushed down his velvety green jacket and breeches then, holding on to his tiny green cap, he sprang from the rock like a grasshopper before he found himself spluttering with Gerald’s goldfish beneath the lily pads. Leopold clicked his bony fingers and six garden spades magically appeared, hovering over the beautiful flower beds, ready for work. Gerald’s face turned a ghastly white as he imagined his cherished roses in tatters. Just then, a mouth-watering aroma of baking wafted across the garden. Leopold’s nose twitched and his tiny tummy gave a loud rumble. ‘My delightful cakes must be ready. Do excuse me.’ Tanya smiled at Leoplod, then rushed off towards the kitchen. Gerald, tactful as ever, took the opportunity to repeat Samuel’s earlier invitation to Leopold, who now gratefully accepted. Over a refreshing cup of tea, with a morsel of one of Tanya’s delicious cakes, the little leprechaun even managed a smile. Michael opened his notebook to jot down suggestions for helping Leopold to search for the gold, without spoiling Gerald’s roses, when a few glistening raindrops plopped in the middle of his page. They scanned the clear, blue sky for the offending cloud, just as another few raindrops tinkled onto Horace’s teapot. A stifled chuckle drew everyone’s attention towards the fish pond, where Cyril was perched, with his fingers in the water. ‘Just my Rainy Day joke,’ he chortled. Later, Leopold stood clutching his crock of gold, his elfish grin stretching from ear to ear. ‘How did your gold get into our pond?’ Freddie asked. With another click and a flash, Leopold and his spades vanished. 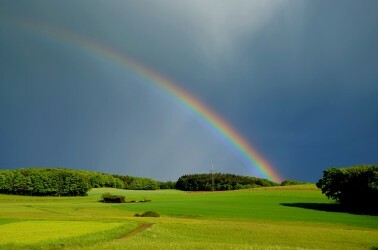 ‘He must be travelling across that rainbow,’ Cyril remarked, pointing up at the sky. Everyone looked at Cyril, and laughed. Thank you, Imran. It’s an odd little story, but I was delighted to find it again. I thought I must have thrown it out! Its a real joy to find old belongings. Such a lovely story, Millie! I’m glad you liked it Daniela. It’s not the sort of thing I generally write nowadays. :) It’s odd to think it’s been hidden in my old file for 20 years. Cute! No finder’s fee? Notoriously tight-fisted, these leprechauns. Yes, Leopold showed no gratitude whatsoever! Tight-fisted little…er…elf! (I believe leprechauns are elves.) I’ll have words with him later. 🙂 Thank you; Ali. Thank you, Jean. I really wasn’t sure whether to post this story or not.It’s so unlike most things I write nowadays and a 20-year-old story seems an odd thing to present. I’d forgotten all about it until the other day, too. I think it’s great you posted the story… it’s a wonderful way to appreciate how your writing style and interests have changed over time! Yes, I suppose there is that. And I do have a soft spot for leprechauns… 🙂 Thank you for the reassuring comment. We have a leprechaun that visits our house around St. Patrick’s Day every year… 🙂 He leaves a trail of gold glitter, chocolate coins wrapped in gold foil, and occasionally “magic” pudding/custard mix (when you add milk to creamy white powder it magically turns green!). This is such a lovely brief story, dear Millie.. Very cute!… he sprang from the rock like a grasshopper …. Can see him! I’d love to see your photos! As for publishing this story, Clare, I’ve never given that a thought. Perhaps I’d be better writing a few more children’s stories and presenting them as a book? Oh dear, We really do need more hours in the day. Thank you for the intriguing idea. Thank you! I was a mere younster myself when I wrote this, Andy (well, I was a lot younger than I am now!). :D Do you know the tea I’m talking about? We bought it when we lived in Devon for a while because they didn’t have Nick’s favourite Yorkshire Tea down there! Our youngest was 11 and insisted we bought the little houses for the Tea Folk characters. We still have them in the loft. I’m not really all that sure which tea it would have been, my parents used to buy ’99’ tea from the Co-op, but I don’t think that had characters with it, it used to come with the cards with pictures and info on the back (butterflies and birds etc). A favorite spot to hang out! Thank you. Enjoy the rest of your Sunday, too. Well, one post a week sounds good to me. Once I’ve posted the two more blog awards I have, I’ll be going down to one post every 7-10 days. I haven’t yet decided whether or not to kick off with a complete blogging break for a couple of weeks. But I do want to keep my blog ticking over while I write. I’ve spent a lot of time last year writing flash fiction stories, which I love to do. I might even get them all together and have them published. But I’ll still visit other blogs as much as I can. Thank you for following me on Twitter, by the way, Inese. I’m very new to that, and just finding my way round it. Lovely story Millie really enjoyed it especially the leprechauns accent. Hope you had an awesome holiday? I sent you an email, let me know what you think. Magical and fun story dear Millie! Love this! That’s a great story, Millie! Industrious little gnomes and an enterprising leprechaun 🙂 I love the garden setting and care of the roses too. I have a little solar gnome house in my backyard, my husband is a big fan of it, but the collie keeps knocking it over so we keep having to glue it. I guess I need to move it. A solar gnome house sounds fascinating! Evidently your collie’s not a fan. 🙂 We still have no gnomes in our garden, L.T. Despite loving the movie, Nick still hates to see gnomes in gardens, or even on sale in garden centres. I was hoping to get the award post up, but I’m really having problems finding nominees. I’ve done the ‘Sisterhood’ one three times now, and I’ve nominated so many people for it before. Apart from which, so many blogs are now Award Free. I think I’ll just have to ‘throw it open’ to anyone. I don’t like doing that, but I need to post pretty pronto. Lol Sorry – this isn’t your problem. It’s just that I said I’d post yesterday and still haven’t done, so this is the reason. It will be posted … eventually. Teenagers are all very different. I’ve had four sons and two daughters, and in our family, three of the boys were more prone to tempers than the other children. If you have a great relationship with your son before teenage years, and he isn’t used to having his own way all the time, or allowed to slam doors etc. unchecked, you’ll be able to handle the hormonal ups and downs. Mutual respect is a big thing in parent-child relationships and children won’t want to rule the roost. Firm but fair – and always lots of love. As I said, it’s always difficult to give advice and I’m pretty sure you’ll simply learn the best way to deal with things over the years. One thing that rarely helps children to grow out of tantrums/tempers – whatever the age – is shouting and screaming back at them. Stay calm and speak firmly and tell him, ‘No, you’ll break it’ when he slams doors. He needs to know it’s unacceptable to you. Yes, that’s meant to good. It gives you both time to calm down. You see, you’re already on the way to success! Be calm but firm. If you ignore the tantrums, many children will simply keep going until they get your attention. Some schools of thought suggest that you do ignore them, and when they see it doesn’t work to get your attention, they’ll shut up…eventually. Doing this would depend on whether or not you can stand the tantrum for that long! anything else, that’s the way to go. Toddler tantrums do end naturally, as a rule. Be careful that he doesn’t see giving him Fireman Sam as a reward for having a tantrum. I just thought that if he sees a strop as a way of getting something he wants, he’ll keep on doing it. Just see how it goes. Staying calm yourself seems to be the key thing. Children often behave far worse when a parent constantly shouts or loses control of the situation. Believe me, it’s the same with teachers who try to keep control by shouting at every little thing. Calm and firm. Is your hair red to match your temper? I love red hair, and have a few relatives who have it. But it isn’t only redheads who can lose their cool. Anyway, bed calls, and I’ll come over and read some of your posts tomorrow. You do so many, I’m afraid I can’t keep up. Lol Persevere with the calm treatment for the tantrums. You could try avoiding.g drinks containing artificial sweeteners too. If you don’t already do that. It makes some children throw huge strops and go quite wild. Matt (the son) only drinks water and no I have brown hair but a mediterranean temper. Good for you. Good luck with it all. Cute – and they are so polite! 😉 I love your new header image, by the way! They are polite, aren’t they? I’m not sure that gnomes are well known for that! The ones I’ve read about are all down-right grumpy. I don’t think the header’s too dark, it just adds a bit of mystery to your blog’s look, in a good way. The picture is awesome, anyway, and it looks very polished 🙂 I’ve been busy, still posting but not stopping by blogs I love to follow as much as I’d like to. Things will slow down soon a bit, luckily 🙂 How’s your book coming along? I’m still not sure that the header suits my page, but I may get used to it in time. Thank you for the kind words about it, anyway. I’m not complaining about the banner itself – it was done by the lovely illustrator who did my book covers. Congratulations to your nomination! I am happy for you and wish you all the best. Thank you, Cecilia.Your words are much appreciated. You’re welcome as always sweetie 🙂 . You and I do have a lot in common. I too harbour a secret desire to have more garden gnomes. ( I only have two left, as they met an unfortunate end with a cement mixer!! ) Although there us a limit to the amount of gnomes one can have in the garden before one tips over to kitsch-essness! Great story. I imagine you would be a famous children’s writer if you so desired and your stories of course would covertly teach children about history and historical figures no doubt. I look forward to more and perhaps a photo of your garden gnomes? Lovely to hear from you, Prateek. I haven’t posted on my blog for almost three weeks now as I’m trying to concentrate on Book 3 of my trilogy. But I do miss my blog! I should be posting again soon, I hope. I shall share it with my boys. I enjoyed reading this, hope I can read the continuation of it.